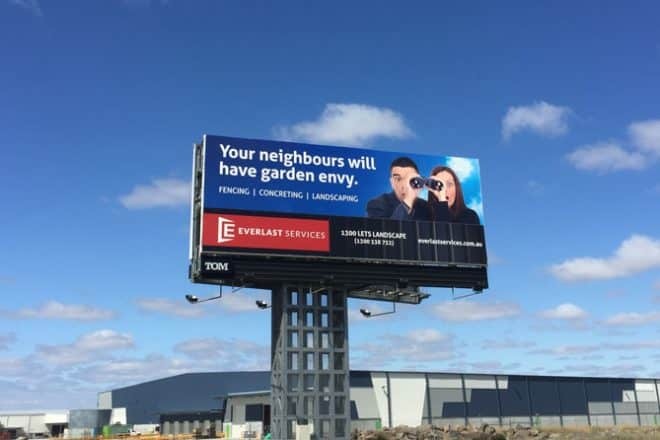 If you have recently been driving on the Western Freeway in Melbourne near the Ballarat and Fitzgerald Road exit, you have may have noticed our brand new billboard ‘Your neighbours will have garden envy.’. This billboard promotes our range of landscaping services that will help to transform your garden so that you (and your neighbours!) can enjoy it for years to come. If you are looking some garden inspiration on what landscaping to do in your garden, feel free to browse our fencing, concreting and landscaping galleries or even check out our recent work in the Everlast Services Portfolio. Everlast Services is based in the Melbourne suburb of Hoppers Crossing, servicing the western suburbs of Melbourne and the greater Melbourne area. We’re a family owned and operated fencing, landscaping and concreting business that manufacture all our own steel products at our state-of-the-art factory. We stand behind the quality of all of the products. We’ve also been in business for more than 20 years so you know that you are in good hands. Everlast Services also now offers no interest EVER! payment plans on products valued up to $15,000.